The first report of a building on this site date back to around 1870. People in this community had to ride into Perry on horseback to attend church. Finally enough people were in the area to have their own church. A log cabin was built which was used for about 20 years. In 1890 a new building was constructed. During the years this building was in use, 6 ministers and an unknown number of deacons came out of the church. On January 26, 1964, the first service was held in the building that is now in use, which is built on the site of the original log building. In September 1887, San Pedro Church, Taylor County, showing a membership of 15 with Rev. W. B. Walters serving as pastor was extended the right of fellowship at the Forty-Fifth Annual Session of the Florida Association. Property was given to the church by Mr. and Mrs. J. R. Grice on February 26, 1892. Mr. and Mrs. B. J. Whitfield deeded some property to the church on March 12, 1930. During these years services were held Saturday morning and night, Sunday morning and night, one weekend each month. In 1936 the church started weekly prayer meetings. Around 1938 the church went to half-time with services on the 2nd and 4th Sundays each month. 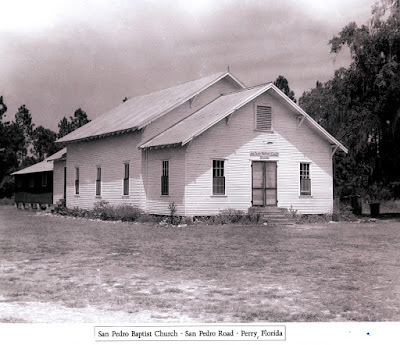 In 1940, San Pedro joined the Middle Florida Association. In 1950, the church went to full time ministry, also organizing Training Union that same year. In 1951 the church organized a Womans Missionary Union and a Brotherhood. 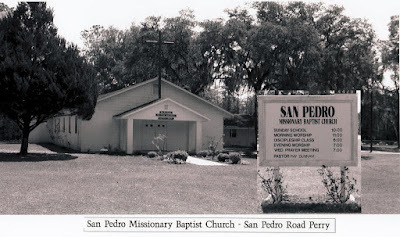 In September of 1953, a large part of the body of San Pedro Church went out and formed what is now known as Lakeside Baptist Church. In 1957, Middle Florida Association granted letters of dismissal to 11 churches including San Pedro to organize Taylor Baptist Association. Mrs. E. O. Lynn gave 1.11 acres of land to the church on July 21, 1955. The pastorium is built on this land. March 29, 1964, the first baptism was held in the church. December 1966, the mortgage was paid off and the building was dedicated on Christmas Day. In February 1968, construction started on the kitchen and fellowship hall on the side of the church. In September 1968, central heat and cooling was installed. June of 1980, San Pedro purchased 1 ½ acres of land behind the church for the purpose of starting a cemetery. The fencing of the San Pedro Cemetery was complete in 1981. Through the years many dedicated and faithful Christians have grown up and come out of San Pedro Baptist Church to proclaim God’s Word to the world. Several young ministers have come out of this church. The deacons and countless faithful members who have given freely of their time and talents through the years, for each and every one of them we give thanks and praise God for his blessings on them.